Side yards separate neighboring houses from each other but are often one of the most neglected areas in the yard. In reality, they are an opportunity to maximize space that many homeowners forget or don’t know how to take advantage of. If your side yard is overgrown or needs a refresh, consider these ideas for making the most of a small space. Here’s a place where toys can remain potentially out of sight from the house and main outdoor living space. 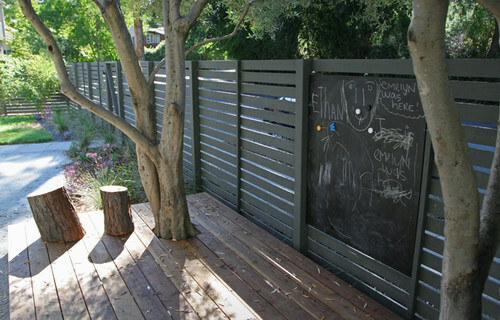 Even the narrowest side yards provide an opportunity for kid fun whether it’s a simple chalk board hung on or built in to an existing fence, a playhouse or a small sandbox for sensory play. One thing to think about is how to supervise the kids if sight lines are limited. Perhaps a nice bench swing or other small seating area might be a nice place to pop open a book or enjoy a drink while they play. Our dog uses the side yard as his personal oasis. When he wants to take a break from kids screaming during a play date or the sun, he retreats to the side of the house. We’ve also trained him to use a small area mulched with decorative bark as his only relief area. As many side yards are shaded by homes, artificial grass is also a soft and practical solution for a pet area. As you can see, it is possible to create a gorgeous space for your pets to hang. 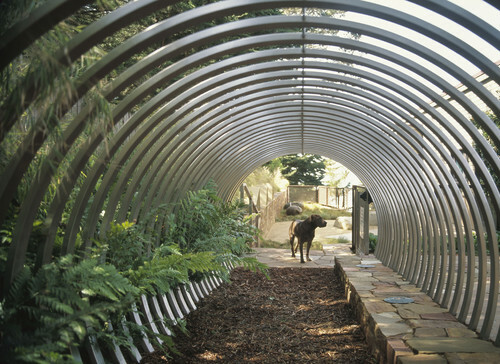 This dog’s stainless steel shade canopy is likely the envy of many humans. 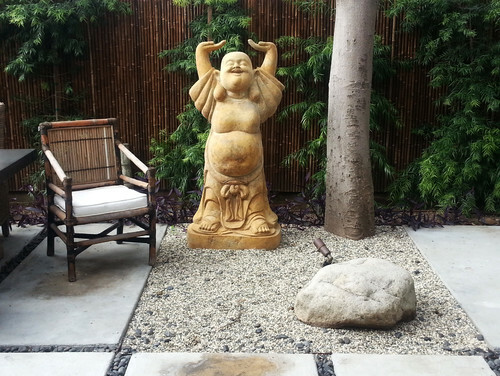 Use the side yard as your own personal space to meditate and recharge by creating a tranquil zen garden. 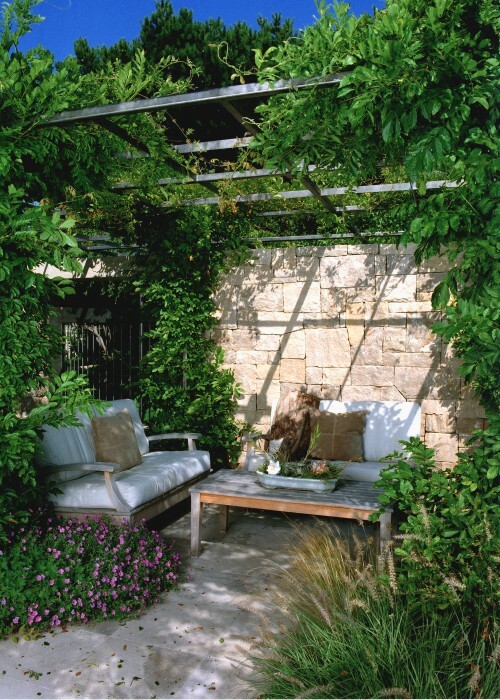 Shade usually present in side yards presents an opportunity for rock gardens as well as hostas, camelias and other plants usually present in these tranquil spaces. No need to track sand from the beach into the house with an outdoor shower, especially since water has been turned off at state beaches due to the California drought. Outdoor showers are also an excellent place to give the dog a bath. An outdoor shower can be as ornate as a indoor shower with creative use of tile. 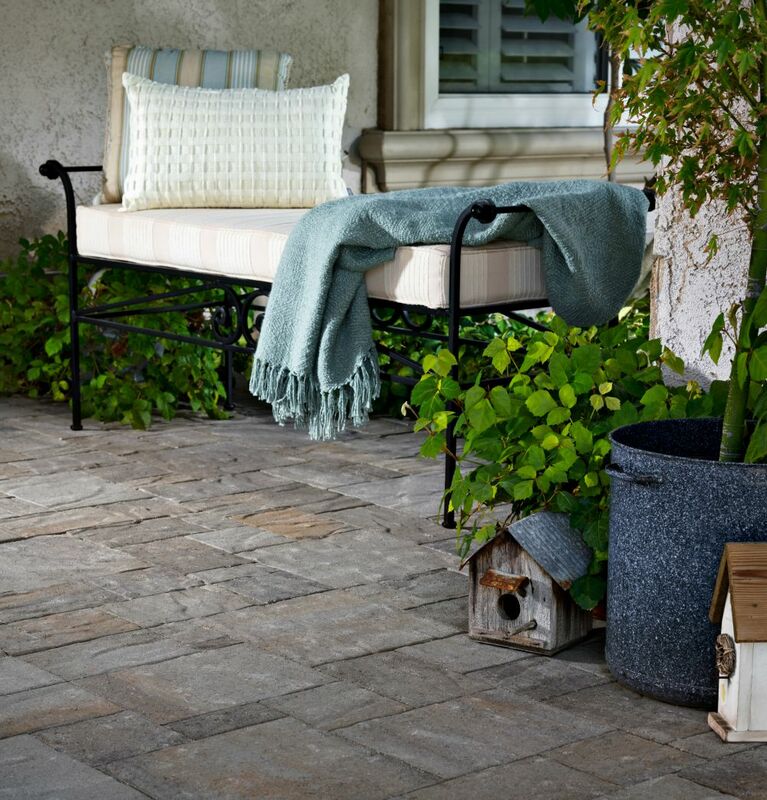 Consider natural elements like stone or a backdrop of pebbles so that it blends into existing yard and home aesthetics. 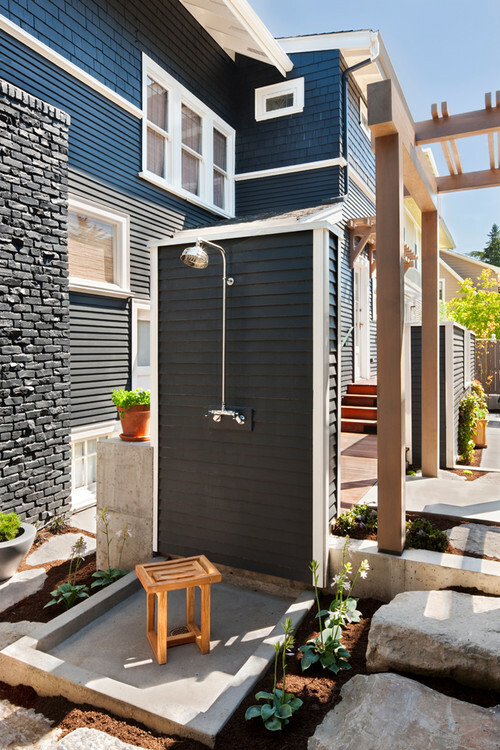 A number of homeowners install outdoor showers as a DIY home improvement projects because they are often sold in kits, but be aware that permits may be required. Some cities require outdoor shower drains to be tied into the sanitary sewage. However, they are good opportunities to repurpose water for irrigation elsewhere, provided any bath products used are biodegradable. Side yard living areas are often shielded from sun and a way to enjoy a private space away from the main outdoor living space. Even small side yards are an opportunity to build benches in to fences or tuck seating into planting areas. The homeowner above created a trellis from the top of the fence to the home for a little extra shade. String lights hung from the top of the fence to the home also provide intimate evening ambiance. Most people store various items in their side yards including trash cans, rain barrels, air conditioning units and more. But, storage certainly doesn’t have to be unsightly and can blend in with the aesthetic of your home or yard. 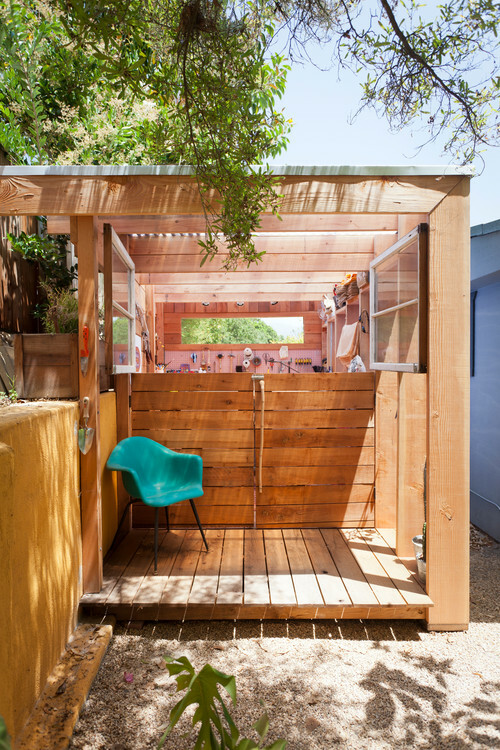 Custom or prefabricated sheds are trending as cool spaces to hang out and keep things like surfboards, garden tools and more out of sight and outside the house. Create a dramatic passage to the front or back yard by framing a focal point that is revealed when gates are opened. 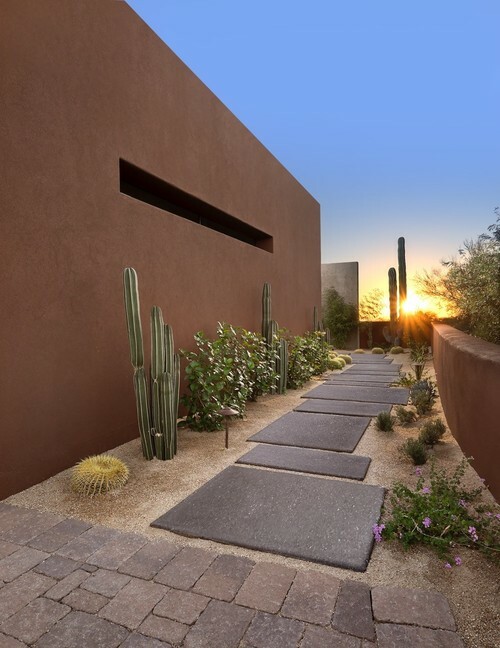 Often times the gate itself is the focal point or there is something naturally scenic to highlight like the tall cacti above in this water-wise garden. 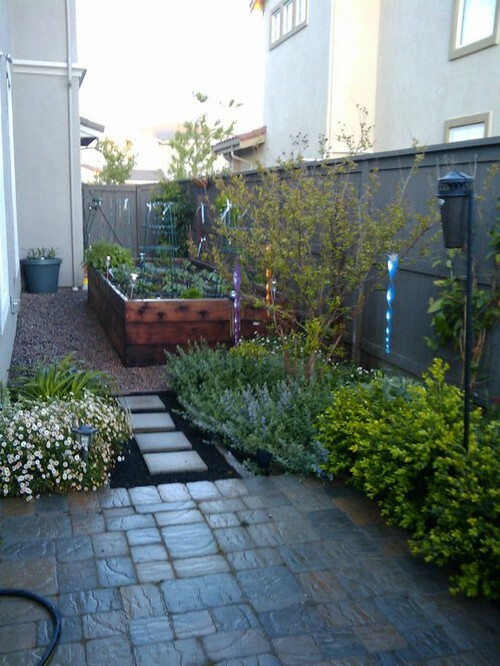 Drown out traffic and neighborhood noise with a water feature in the side yard. 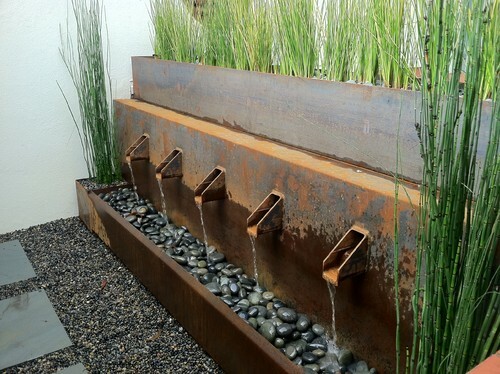 Not only does it look good, but running water tends to relieve stress and is an outdoor feng shui technique. Consider placing a fountain or similar near a home office window or bedroom. Make sure it has a recirculating pump which helps limit the need to add new water by keeping it moving, a requirement in many California cities due to the drought. Cover an unsightly fence with a vertical garden that can be a lush tropical wall like the above, a vegetable garden, succulents or even plants for cut flowers. Vertical gardens are actually less complicated to hang than you might expect. Hang multiple rows of specially-made, inexpensive pockets along the fence that will eventually be covered by the plants as they grow. Whether or not you’ll be able to use a side yard for a vegetable garden will depend on the amount of sunlight the area receives. But, if conditions permit, why not transform this space into an edible garden to grow healthier produce for your family and reduce carbon footprint. Remember also that there are plenty of vegetables that can grow as container plants, even hanging baskets though raised planters with nutrient rich soil provide the best growing medium. 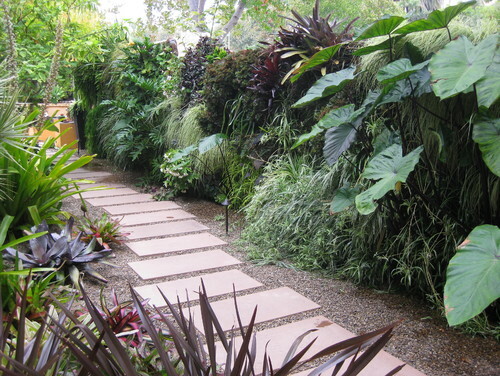 What is the most creative use of a side yard that you have seen?